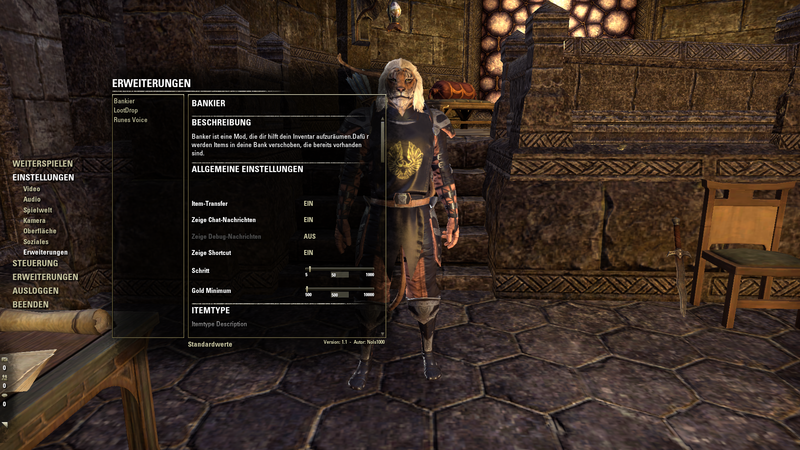 Banker is an addon for The Elder Scrolls Online that helps to keep the bag and bank account organized by depositing stackable items in the bank account, either automatic or with one keypress. You can report bugs at Nexusmods or at Github. The changelog can be found in the file Changelog.md. This project is licensed under the GPLv3 - see the LICENSE file for details. Also I can't get the menu, everything is black. I guess this is because I am on the French client? Does this stack to 100 or 200? I'm guessing it should be the latter as it has been regularly updated. something went wrong on the last update and i cant transfer other than gold and potions. 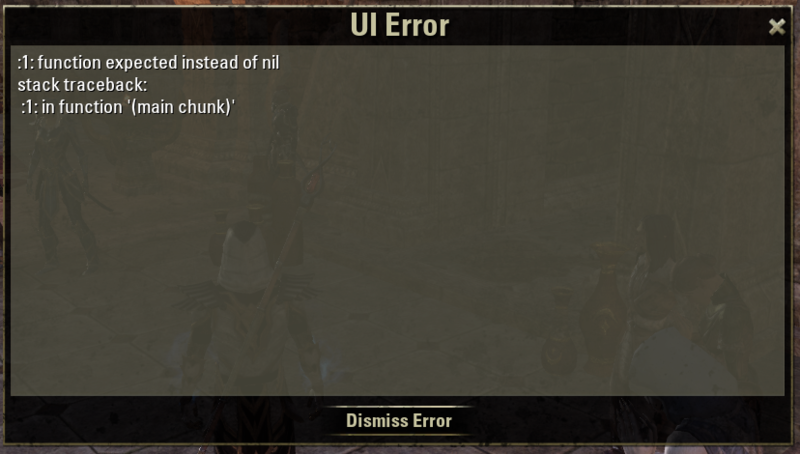 i did try to use the old one but then i get the nil error when trying to send items to the bank. For some reason everything works fine for me, but not the gold transfer per hotkey. it works fine at the bank with the auto transfer and also the hotkey for the items - just not the gold. The message appears, but the gold amount does not change. Edit: mh, not everything I see. Some items are transfered, but not all, even though a stack exists in the bank and the item is activated in the list of Bankers options. Some style stones, tannins etc. My bad I forgot to add the button. Plays the Runes sound when yo pick it up. Last edited by Nols1000 : 04/24/15 at 01:03 PM. Last edited by Harodath : 04/16/15 at 07:59 AM. I always get this error when pressing the "Transfer items" key-binded key. Awesome! It works perfectly, thank you very much! yeah i have usedthis since the first day and did some change to get it work when author was gone, nice to have u back. BUT, i have a problem now, i cant turn off the gold transfer anymore? only change the amount of value, please tell me how i can stop the money transfer or point me in the right spot to do it. I can't make heads or tails of it, and I haven't seen anyone post here with this error. I am not sure what the LibStub and LibAddonMenu files are for (the 2 links on the main/download page) or if they're even necessary for the Banker addon to run. Should be fixed with the update about 4am. Tell me if you have futher problems. "The panel with id 'BankerOptions' was registered before addon loading has completed. 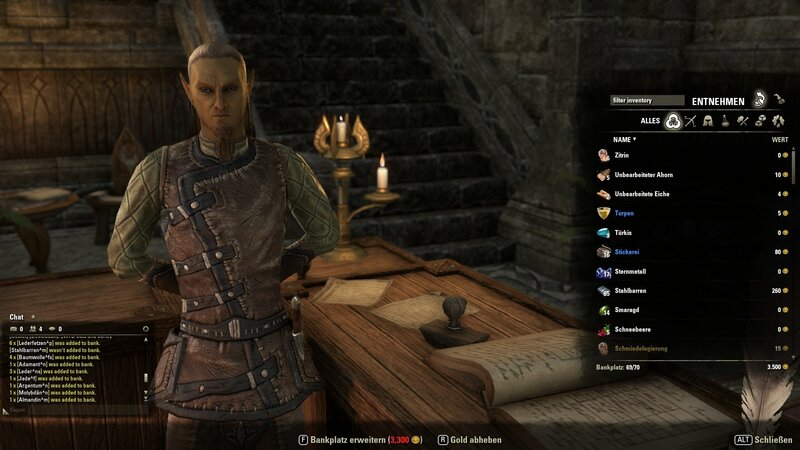 This might break the AddOn settings menu." Both errors are gone now. Thanks for the update! Last edited by Rookjay : 04/04/15 at 07:10 PM. "Transfers already stored items to your deposit box"
The line directly above your mentioned line. Add items to your deposit box and they will be increased if you have them in your inventory. The configuration of the items (like a white- or blacklist) has been removed. It's meant as Beatram said. as always - only i can see this? If you like my work and you have to much money, Flattr it or donate via PayPal.